The goal of the cohesion policy of the EU is to reestablish the regional unbalances from the Community, contributes to the reduction of the differences between the development levels of various regions and the recovery of the disparity by the less favored regions. Between 2007 and 2013 there are put at disposal structural funds of 307,6 billion Euros (35,7% of the budget) for the regional development. 83% of this fund is concentrated towards convergence goals and are destined to the poorest regions and state members of the union. Separately for agriculture there is a special fund, European Agriculture Fund (FEADR). (Asore Islands, Madeira, Guadelupa etc.). < 90% from the European average. members propose a list of regions. The regions marked in red are eligible for financing during the above-mentioned period. 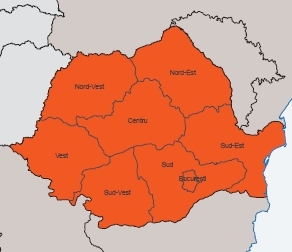 All the regions from Romania comply with the conditions and are eligible for financing between 2007 and 2013. Convergence goal: 12.661 million EUR. Territorial cooperation: 455 milion EUR. Total: 19,668 billion EUR (situation and tariff: October 2006).